These definitions, taken from the Munsell Manual of Color, were originally published in 1929. Learning the meaning behind color terms, will help to better understand how the color system works. A color of the lowest VALUE. It possesses neither HUE nor CHROMA.· It is seen when looking through a small aperture into a hollow black velvet-lined box. See Black. A color of the very highest VALUE. It possesses neither HUE nor CHROMA. It is closely approximated by viewing a freshly-cleaned block of magnesia. See White. A Neutral Color of very low VALUE, usually about one and one-half in VALUE. See Absolute Black. The strength or weakness of a Chromatic Color. In terms of CHROMA, color is described as Weak, Moderate, or Strong. Synonyms: Saturation; Intensity (Purity). See Chromatic Colors. Include all colors other than Neutral Colors. (See Neutral Colors.) They are char­acterized by the presence of both HUE and CHROMA. See also Color. Note: When the meaning is perfectly clear, we can and do use the word Color in the sense of Chromatic Color. Terms such as Color Blindness, Color Photography, Color Printing intrinsically are perfectly understandable. It is only in a technical treatise that one should use the terms Chromatic Color Blindness, Chromatic Color Photography, Chromatic Color Printing, etc. Anything seen by the eye, such as Black, White, Red, Yellow, Green, Blue, or Purple. The form of an object is recognized only because of the contrast between the color or colors of this object and the color or colors of the background. Color is accompanied by an excitation of the retina and brain by beams of light. See Chromatic Colors; Neutral Colors. In its broadest meaning, color balance is an aaesthetic term refering to the feeling of balance, continuity, and fitness which is found in beautiful color schemes. In a more restricted sense, it applies to the physical balance of a color scheme in Gray. In such a case the colors in a color scheme are assembled on a disc in pie-­shaped areas or sectors. The size of each of these sectors is proportional to the area of each color in the color scheme. If the disc areas blend to a Neutral Gray when the disc is rotated, the color scheme is said to balance. With experience this form of physical Color Balance can be detected by the unaided eye. Studies and exercises in Color Balance will broaden one’s experience and improve one’s color technique just as studies and exercises in Musical Harmony broaden one’s experience and improve one’s musical technique. It is not suggested that studies and exercises be limited to Color Balance, since such studies are but the stepping stones leading to the study of Color Dominance. See Color Dominance. The inability to distinguish colors properly which is associated with a subnormal perception of HUE and CHROMA. It may be either congenital or due to injury to the eye. A series of Color Scales (See Color Scale), so arranged that any two dimensions of color vary in a regular manner, while the third dimension remains constant. See Color Dimensions. The delineation of color by means of words. A vocabulary of but fourteen words is sufficient for a simple description of any color. HUE is comprehended by five words-Red, Yellow, Green, Blue, and Purple-used either singly or in conjunction with each other. (See Major Hues.) The terms, Black, Gray, and White are used when HUE and CHROMA are absent. VALUE is comprehended by three words-dark, middle, and light, CHROMA is comprehended by three words­ — weak, moderate, and strong. The word describing VALUE may well be placed first, the HUE second, and the CHROMA third, as” a Dark Red of moderate CHROMA,” i.e., a Maroon. See also Color Notation; Hue; Value; Chroma. HUE, VALUE, and CHROMA. These three dimensions describe any color as accurately and as readily as the three dimensions of a box describe its length, breadth, and thickness. Synonyms: Color Attributes; Color Qualities. See Color. This is found in a color scheme in which some one HUE predominates. Intelligently employed, it suggests different moods or atmospheres, typified in various cases by Valor, Inspiration, Fruitfulness, Truth, Royalty, etc. There is no better training for the effective handling of Color Dominance than the study of Color Balance. See Color Balance. An exact and specific description of a color, using symbols and numerals, written HUE VALUE/CHROMA. For example a typical Maroon is notated as “5R 3/4.” See Hue, Value, Chroma for notations of each. See also Color Description. A series of colors, exhibiting a regular change or gradation in one dimension, while the other two dimensions are constant. For instance, a VALUE Scale progresses by evenly-graded steps from Black to White. (See Value Scale.) A CHROMA Scale progresses by evenly-graded steps from Neutral Gray to a strong color. (See Chroma.) A HUE Circle is a Scale of evenly-spaced Hues. (See Hue Circle.) See also Color Dimensions. The top pole of the Color Sphere is White, the bottom pole Black, and the axis is the graduated scale of NEUTRAL Grays, which places N 5/ in the exact center of the Sphere. Clockwise, or “westward,” around the equator of the Sphere (as seen from the top pole), and at equal distances apart, are the five Principal HUES – Red, Yellow, Green, Blue, and Purple. Spaced evenly between each two of these, in the order names, are the five Intermediate HUES – Yellow-Red, Green-Yellow, Blue-Green, Purple-Blue, and Red-Purple. These ten HUES are called the Major HUES. Each of the ten Major HUES occupy one segment of the sphere, its upper half blending through light VALUES to White at the top and its lower half blending through darker VALUES to Black at the bottom. Its inner edge, along the perpendicular axis of the Sphere, would be the graduated series of NEUTRAL Grays from Black up to White. Outward horizontally (at a right angle) from the NEUTRAL axis, at any level of VALUE, the color would become more intense in color strength, in measured steps of CHROMA. The HUES become lighter as they go upward in VALUE; darker as they go inward toward the NEUTRAL axis; and stronger in CHROMA as they go outward toward maximum strength. A conception used in advanced color study which is very useful as a supplement to the idea of a Color Sphere. The vertical trunk of this Color Tree corresponds to the vertical value-scale axis of the sphere. The branches extend outward horizontally from the trunk. Each branch represents a series of colors of constant HUE and constant VALUE but increasing in CHROMA as the distance from the Neutral Gray trunk becomes greater. Those branches which originate at the same height on the trunk bear colors of equal value, dark colors being found on the lower levels and light colors on the higher levels. Those branches which point in the same direction from the trunk bear colors of the same HUE. The branches which represent the ten major HUES are spaced at equal intervals around the trunk. Each branch is in reality a CHROMA scale, beginning in Neutral Gray at the trunk of the tree, and ending in the strongest available CHROMA of the particular HUE and VALUE represented by that branch. If the number of branches is infinitely increased the tree will expand into a complete color solid. Two Hues which differ most radically from each other. Pairs of Complementary HUES are shown directly opposite each other, on the Radial Charts of constant VALUE, in the Standard Edition of the Munsell Book of Color. Green, Blue-Green, Blue, and Purple-Blue. See Warm Colors. A color of low VALUE, found in or adjacent to the lower third of the VALUE scale. See Value. A color which possesses neither HUE nor CHROMA, i.e. a Neutral Color. (See Neutral Color). Where considerable clarity is desired, this meaning of Gray may be expresses as Neutral Gray. Traditionally, Grays are colors between Black and White, in the region from zero to about one step of CHROMA. The VALUE level at which the maximum CHROMA is reached in some particular HUE. It varies for different HUES, i.e., in Yellow, it is at the eighth level; in Green: at the fifth level; and in Purple­-Blue at the third level. The “home” level also varies for different color mediums. See Maximum Color. The distinctive primary characteristic of any Chromatic Color. In terms of HUE we describe a color as Red, Yellow, Green, Blue, or Purple. See also Chromatic Colors. Exhibits a progressively-graded series of HUES, equally spaced to the eye, and of constant VALUE and CHROMA. See Hue Circuit. Exhibits a progressively-graded series of HUES equally spaced to the eye. VALUE and CHROMA are not necessarily constant. See Hue Circle. 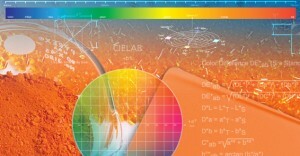 See Principal Hues; Intermediate Hues; Major Hues; Second Intermediate Hues; Special Intermediate Hues. See also Complementary Hues. Yellow-Red, Green-Yellow, Blue-Green, Purple-Blue, and Red-Purple. These five HUES are placed at the visually determined mid-points between the five Principal Hues. (See Principal Hues.) See also Hue; Major Hues. Notation. Relates to nerve currents, set up in the optic nerve and brain by the stimulation of the retina due to the visible portion of the radiant energy thrown out by such a source as the sun. The luminous energy which gives rise to color. A color of high VALUE, found in or adjacent to the upper third of the VALUE Scale. See Value. Three spectrally pure beams of light, by the blending of which a great number of colors can be seen. Three wave-lengths frequently used are 650 mµ, 550 mµ, and 46o mµ, corresponding in general to the hues RP-R, GY-G, and PB-P. See Primary Colors. Ten HUES, made up of the five Principal HUES and the five Intermediate HUES. (See Principal HUES; Intermediate HUES.) These ten HUES have been chosen not because they are ten in number-although the Decimal System is very convenient-but because they represent mutually equidistant Hue-points to the eye. See also Hue. A color of very strong CHROMA, on a VALUE Level characteristic of the HUE in question -i.e., its “Home” VALUE Level. (See Home Value Level.) As a general rule Maximum Yellow is on the eighth level of VALUE, Maximum Purple-Blue on the third level, etc. The reason for this interesting variation of Maxima Colors in different HUES is due not to any physical characteristics or complexities inherent in the colored media which we use, but rather to the sensitive and unique adjustment of the mechanism of the eye and brain. The word “Maximum” is a relative term, referring to the strongest color in any HUE which can be evoked by some particular color medium. Thus the maximum Color in any single HUE may vary for different color media. The maxima shown on the standard color charts, which have been selected as the strongest colors which are reasonably permanent, represent one class of Maxima; printing inks represent another class of Maxima; and Oil Colors, Dyes, Ceramics, etc., further classes of Maxima. See Ultimate Color. A color of middle VALUE, found in or adjacent to the middle third of the VALUE Scale. The word “middle” should be differentiated from the word “moderate” as given in the next definition. See Mod­erate Color; Value. A color of moderate CHROMA, found near the fourth to sixth step of CHROMA on the standard Color Charts. See Middle Color; Chroma. Characterized by a complete absence of HUE and CHROMA. They are pure Black, pure White, and the pure Grays lying between. Synonym: Achromatic Colors. See Color; Chromatic Colors. A Red pigment, a Yellow pigment, and a Purple-Blue pigment. It is assumed that there are three pigments or three dyes, by the intermixture of which a considerable number of colors can be evoked. In practice there are more than three. For instance, two different pigments of the same HUE will act quite differently when mixed with a pigment of some other HUE. Such complexities are due to the multiple absorption of light within the pigment layer, and to the different sizes of the pigment granules. Pigment-mixture Primaries describe the results of Pigment-mixture and as such are important. They are, however, positively misleading if one attempts to use them to describe color as the eye sees it. These are assumed to be inherently more essential than certain other colors which result from the mixing or blending of the Primary Colors. There are three kinds of Primary Colors: Light Primaries, Pigment-mixture Primaries, and Psychological Primaries. See Light Primaries; Pigment-Mixture Primaries; Psycho­logical Primaries. Red, Yellow, Green, Blue, and Purple. These five HUES have been chosen not because they are five in number, but because they are visually equidistant from each other in Hue. See Intermediate Hues; Major Hues; Hue. Black and White; Yellow and Purple-Blue, Red and Green. Dr. Christine Ladd-Franklin has proposed the very reasonable hypothesis that the simplest eye sees merely achromatic colors (See Achromatic Colors); that a more complex eye sees Yellow and Purple-Blue in addition to achromatic colors; and that in fully developed vision that ability to see Yellow splits up into the ability to see Red and Green. Her theory explains in this way how it happens that Red and Green, instead of making a series of reddish Greens (as Red and Purple-Blue make a series of reddish Blues, or Purples), vanish when mixed in proper proportion, and produce Yellow; and that in the same way, Yellow and Purple-Blue produce White. See Primary Colors. The Color percentage of incident light reflected from a sample. See Value. Additional HUES placed at the visually determined mid-points between each of the ten Major HUES. See Major Hues, Hue. The color evoked when looking at the mixture of a chromatic pigment with a black pigment, or of a chromatic dye with a black dye. The appearance of that portion of a surface which lies in a shadow. See Tint. All HUES not classified as Principal, Intermediate, or Second Intermediate HUES. The following list of the HUES in the Red group shows the relation of the Special Intermediate HUES to the Major HUES and to the Second Intermediate HUES. See Hues. Note: The HUE of a color, which occurs between any two Special Intermediate HUES, may be expressed decimally. The sensation evoked from spectrally pure light (i.e. from but a few closely-adjacent wave-lengths in the spectrum.) See Visible Spectrum. A color of pronounced CHROMA, found in the neighborhood of the seventh or eigth steps of CHROMA. Colors of still stronger CHROMA may be described as very strong. See Chroma. The color evoked when looking at the mixture of a chromatic pigment and a white pigment. The color evoked when small amounts of pigment or dye are thinly applied to a white paper or white cloth surface. See Shade. A color of very strong CHROMA on any VALUE level other than the “Home” VALUE level. See Home Value Level; Maximum Color. The lightness or darkness of any color. In terms of VALUE we describe all colors as dark, middle, or light. There are no universally accepted synonyms for VALUE. Among those used to a limited extent are: Brightness, Brilliance, Luminosity. A horizontal slice through the Color Sphere or Color Tree, on which all colors are of the same VALUE. See Color Sphere; Color Tree. A series of visually equidistant Neutral Colors, lying between Absolute Black and Absolute White. The revised Munsell VALUE Scale, found on the standard color charts, represents the averaged results obtained by seven experienced observers. The following table shows the relationship between VALUE and Reflection factor. The results of passing a beam of light through a glass prism. By this means it is broken up into an invariable sequence of colors of subtly varying HUE and of very strong CHROMA. See Light. Red-Purple, Red, Yellow-Red, and Yellow. See Cool Colors. A color of reduced CHROMA, found in the neighborhood of the second or third steps of CHROMA. See Chroma. A Neutral Color of very high VALUE, usually in the neighborhood of the ninth VALUE Level. See Absolute White.